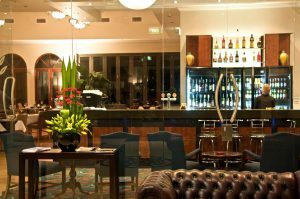 Named in honour of Clem Jones’ wife, Sylvia’s Restaurant & Wine Bar comfortably seats 85 in the restaurant with a lounge area in the wine bar. Open for breakfast from 6.30am to 8.30am Monday to Friday, and with continental breakfast trays available for motel guests von the weekend, it’s the perfect place for a breakfast meeting with plenty of parking. Click here to view the Breakfast Menu. Dinner service starts at 5.30pm Monday to Saturday. Click here to view the Dinner Menu. The restaurant is closed on Sundays and all public holidays. A dress code applies and gift vouchers are available. Make sure you like our Facebook page so you will be notified when we hold one of our fabulous themed nights at Sylvia’s! Our chefs are local professionals who create inspiring modern Australian dishes with a French influence. They also enjoy using flavours from the Middle-East, Japan and the sub-continent and treat each dish like an artistic expression. 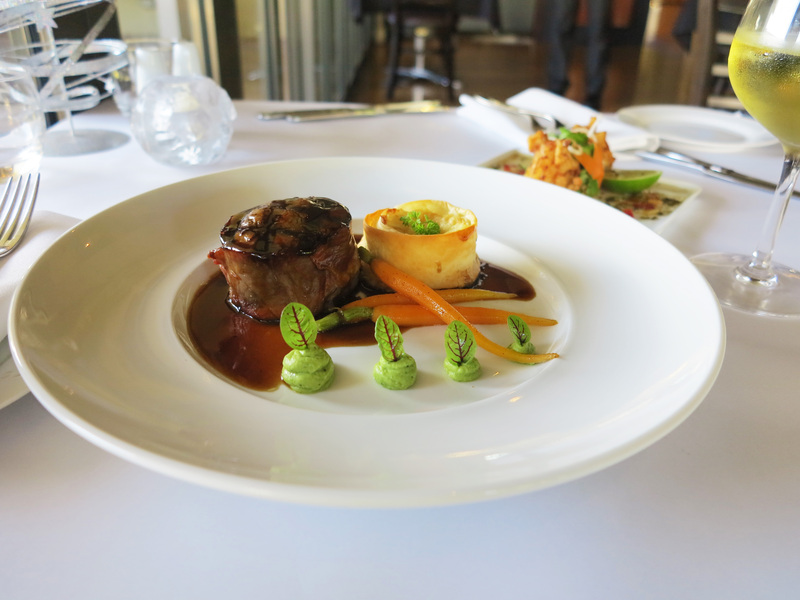 A favourite dish is Prosciutto wrapped fillet mignon served with mini cottage pie, pea puree, baby carrots & jus. Definitely worth trying! 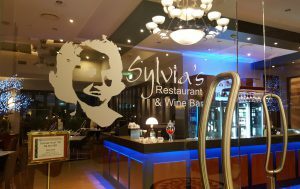 The team at Sylvia’s will cater for larger parties with more than ten people and the whole restaurant can be booked out for large gatherings. Depending on the booked patronage, we may offer a special fine dining menu featuring a selection of our most popular dishes in order to provide a better service. For special occasion bookings, our special menus can be personally printed with a menu for each diner acknowledging the occasion. You may also wish to consider our private dining options for a more intimate dining experience. Sylvia’s Wine Bar is the perfect place to meet for a wine, beer or cocktail with bar-side chairs or comfy lounges to relax on. We carry an extensive range of liquor including local Bayside Pale and Queensland Ale from Bacchus Brewing at Capalaba, and the ever popular Asahi Super Dry on tap. Click here to view our Wine List. Please click the Make An Enquiry button below to contact us with any questions.